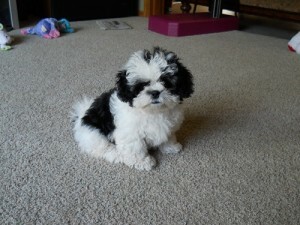 Our Puppies are 1st Generation, they have purebred Shih Tzu and purebred Bichon Frise parents. Our Puppies are raised in our home, surrounded by grandchildren who love and play with them! The puppies have their shots up to date, a Vet certificate and 2 year health guarantee! We are Wisconsin State Licensed: 267981. Visitors are always welcome! Looking to replace our recently departed, sweet precious dog. She was a teddy, lovely white ball of fluff. A great part of the family, I miss her most on some days. It is very hard on those days, today is one of those. We are not a family of great financial means but our love makes up the difference. We have two cats and two older children, and an elderly father-in-law soon to join our family. We were hoping our Flower puppy would help him and comfort him in his final days, or years. They were the best of buddies. She would wait by the door for him to visit every day. I know he misses her as well. Do you have any puppies available for us to view. Willing to travel to pick it up. Price range $300.00 to $500.00.